In China there are about 8 million unnatural deaths every years and of these about 400,000 are said to be due to medical accidents - often due to unsafe use of medicines. To try and remedy this poor situation, September has been nominated as national medication safety month by the China State Food and Drug Administration. 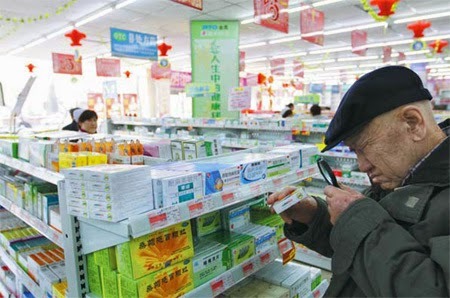 According to pharmacist Zhang Jichun of the Chinese Pharmaceutical Association, this high rate of accidents and adverse reactions with medications is due to widespread ignorance in the population about appropriate use of medical drugs. A recent survey of more than one million Chinese found that only about one in ten could answer correctly questions about basic drug safe use. The higher error rate with drug misuse included allergic reactions to antibiotics in babies and infants, misuse of drugs by pregnant women causing birth defects and adverse birth outcomes, accidental drug overdoses, misuse of sleeping tablets causing accidents, using drugs past their shelf life, taking multiple drugs and causing interactions, abuse of weight loss drugs causing cardiac problems and deaths and failing to use cardiac drugs in sufficient doses leading to heart attacks and strokes. The survey found that there were many problems with the way Chinese people used medications. About 90% bought prescription drugs from pharmacies and self-treated without getting advice or a diagnosis from a doctor. Almost 70% did not read the package insert and a third made major mistakes in dosing while 25% did not take the medicine correctly and failed o get the expected benefit. Zhang Jichun said many of the problems with drugs occurred in children and the elderly, who were more susceptible to their effects. A typical and common avoidable serious problem was deafness seen in 300,000 children due to overuse of some classes of antibiotics. This side effect occurred due to parental medication without being aware of the risks. In the elderly one of the main problems was excessive medication, he added. Many elderly people take several different drugs for various ailments without understanding that they can interact to cause severe side effects, he said. Elderly people also made the mistake of taking western medicines with Chinese traditional medications, and this could also cause problems he said. To try address this problem the China Pharmaceutical Association has set up a "medication safety expert advice hotline” and invites all Chinese to seek advice before using medications.